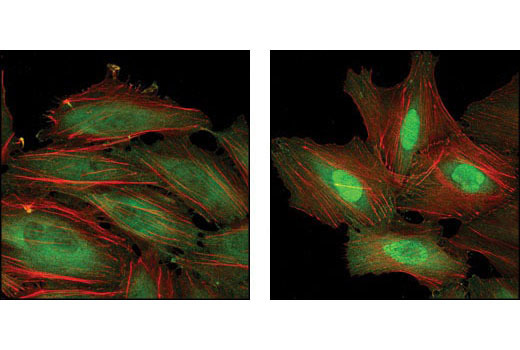 Confocal immunofluorescent analysis of HeLa cells, untreated (left) or heat shocked (right), using HSP70 (6B3) Rat mAb #4873 detected with Anti-rat IgG (H+L), (Alexa Fluor® 488 Conjugate) (green). Actin filaments have been labeled with Alexa Fluor® 555 phalloidin (red). Anti-rat IgG (H+L) antibody was conjugated to Alexa Fluor® 488 fluorescent dye under optimal conditions and formulated at 2 mg/ml. This product has been optimized for use as a secondary antibody in immunofluorescent applications. Cell Signaling Technology’s strict quality control procedures assure that each conjugate provides optimal specificity and fluorescence.